Salmon Cakes and Tzatziki Sauce - Let the Baking Begin! Salmon season is once again upon us and it’s time to make delicious Salmon Cakes. 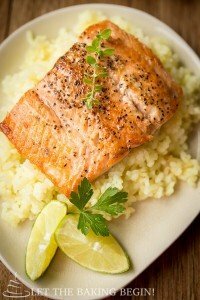 I saw the recipe on userealbutter, and because the list of ways to use salmon was exhausted, I decided to give it a try. 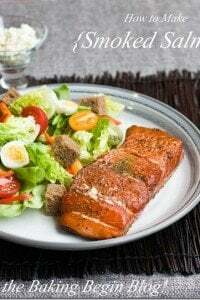 What I love about this recipe is the fact that Salmon Cakes come out very moist on the inside with tons of flavor. When I fillet the fish, usually there’s some fish meat still left on the bones, so I take a teaspoon and scrape the leftover fish off the bones. Guess what I do with those fish scraps? 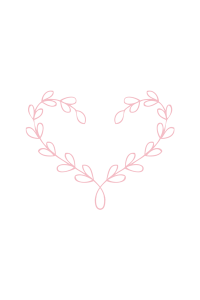 You got it! Salmon cakes! 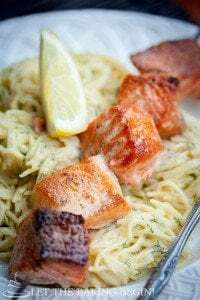 Crusted Salmon Bake – Salmon casserole with cheesy Parmesan cheese. 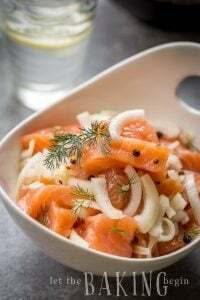 Aromatic Cured Salmon Recipe – Fish cured in a salty-sweet brine with spices. 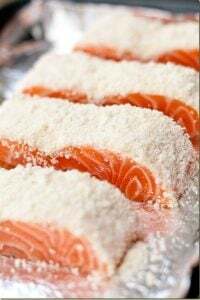 Parmesan Crusted Salmon – The best salmon recipe. 1/2 up oil for frying (olive oil, avocado oil). Mix salmon, bread crumbs, mayonnaise, onion, parsley, salt and lemon juice together. Carefully form 3 inch round patties, about 3/4 inch thick. Place patties on a parchment lined baking sheet and put in the freezer for 30 minutes. Meanwhile place flour in one bowl, beaten eggs in second bowl and panco breadcrumbs in the third bowl. First dip each cake in the flour, making sure it’s completely covered, tap off excess. Then dip it into the beaten egg, and finally into the Panco crumbs. Set cakes on a large plate, until you have enough for one batch or frying. Heat a frying pan with some oil, until hot. Place salmon cakes in, and fry for about 2-3 minutes per side, on medium- high heat. Remove to a paper towel lined plate. Transfer cakes to a serving plate and eat right away with the sauce on the side. Bacon Wrapped Pork Kabobs Recipe - Let the Baking Begin! Grilled Chicken Kabobs Recipe - Let the Baking Begin! Spinach and Feta Phyllo Triangles - Spanakopita - Let the Baking Begin! Spinach and Feta Phyllo Triangles - Spanokopita - Let the Baking Begin! Spinach and Feta Phyllo Triangles - Spanokopita - Let the Baking Begin! Let the Baking Begin! Could this also be done using canned salmon? Salmon is a tad expensive in these parts!